Supremely grotesque western contains so many unsettling visual elements, even Lionel Stander's ogre face in extreme close-up appears benign next to the revolting, cross-eyed midgets, weirdos, and other assorted, unhygienic freaks who smear across director Giuseppe Collizi's screen. Terence Hill lays low in a traveling circus that features Woody Strode as an acrobat and badass gunslinger. Soon, they recruit the help of Bud Spencer, his homosexual partner(? ), and numerous big-top mutants to defeat some money-drubbing real estate agents who control the town. One of the screenwriters obviously decided to showcase his knowledge of land reform, as the movie explores Old West topography rights at more unwanted length than John Ford indulged himself documenting voter's rights in The Man Who Shot Liberty Valance. But there's enough unbalance in this western to recommend it, and it's not boring. Collizii has plenty of style and shows inspired camera set-ups, particularly during the action scenes, and his photography captures such eccentric details as a scorpion crawling in a man's hat. But the psychedelic close-ups, combined with the frenzied editing, are migraine-inducing. Much of the facial camera-work is near endoscopy, as the huge, ravaged faces of the towns-people begin to reveal cell structure. 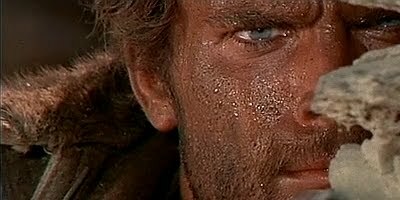 The movie's set design suspiciously resembles that of Enzo Castellari's equally surreal and nightmarish Cry, Onion, and Collizi's night exteriors render Terence Hill's bright teeth and eyes as practically extraterrestrial, oftentimes providing scenes with their only light source. An Italian named Bixio provides a funky score with jazz bass lines to accompany the horses. Strode takes care to eliminate one bad guy who makes the mistake of calling him a "damn monkey" on a trapeze.